Soba makes me happy. Sometimes I want to go totally sans gluten and opt for the 100% buckwheat soba but be warned, the flavor is very strong. Otherwise go for a blend if your belly says ok.
Cook soba according to package directions, rinse under cold water and set aside. Steam edamame pods and then run under cold water. Pop the beans out from the pods and add to the cooked noodles. I suppose this adds time but you could trust the frozen pre-shelled edamame and cut out this step. In the meantime heat oil in a skillet and fry the garlic and ginger. 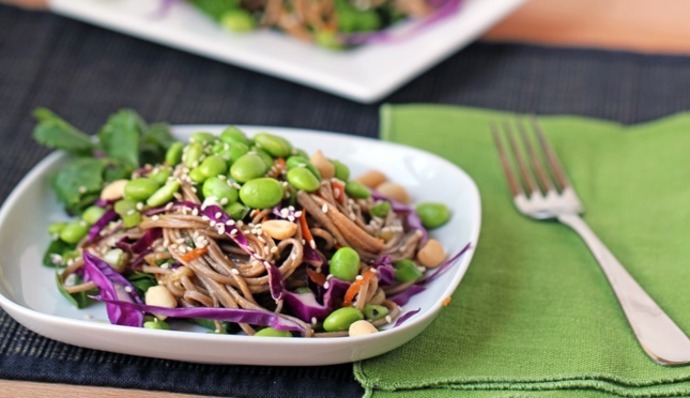 Toss with the noodles, edamame and generous amount of black sesame seeds.